KUALA LUMPUR (March 11): Foreign funds pulled out RM903.2 million net of local equities last week, from a net outflow of RM447.7 million the prior week, according to MIDF Amanah Investment Bank Bhd Research. In his weekly fund flow report today, MIDF Research’s Adam M Rahim said this was the largest outflow in 21 weeks. “Foreign net outflow reached RM198.6 million on Monday before swelling further to RM263.3 million on Tuesday, the largest in a day so far this year. after an overnight sell-off on Wall Street amidst an unexpected 0.6% fall in U.S construction spending for December 2018,” he said. Adam said the level of foreign net selling gradually tapered on the next two days to reach RM105.2 million on Thursday. He said the shrinkage of foreign selling mainly came from the news of the Chinese government pledging to enact stimulus measures to boost the economy. He said the local bourse followed suit to marginally gain on those two days. 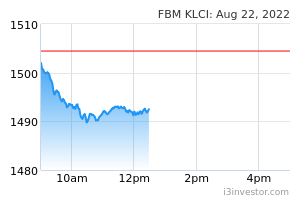 “However, a heavy selloff occurred again on Friday at a tune of RM193.3 million net. “Losses across Asian markets including Malaysia accelerated following the 20.7% year-on-year slump China’s exports in February 2019,” he said. Adam said for the first six trading days of March 2019, international investors have sold RM1.06 billion net. “As such, foreign funds have so far disposed RM849.9 million net on a year-to-date basis. “On the regional front, Malaysia is now the nation with the highest foreign net outflow amongst the four ASEAN markets we monitor while Indonesia continues to lead with a year-to-date foreign net inflow of US$817.9 million or above RM3 billion amidst the pre-election hype taking place in the nation,” he said. Adam said that participation amongst the three investor groups remained healthy. However, he said only foreign investors saw an 18.4% decrease in terms of average daily traded value (ADTV) last week while local institutions and retail investors experienced an increase.